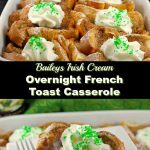 You are here: Home / Recipes / Breakfast and Brunch Recipes / Baileys Irish Cream Overnight French Toast Casserole: St. Patrick’s Day Breakfast! 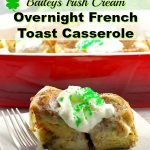 St. Patrick’s Day is coming and if you’re wondering what to make, this This Baileys Irish Cream Overnight Baked French Toast Casserole makes a really great breakfast or brunch potluck dish. I’d even eat it for dessert; it’s that good! It may be the Baileys talking but this is the best french toast casserole I’ve ever had! But Baileys makes everything better, doesn’t it? What I love about overnight baked french toast casserole is that it’s so easy! It only takes a few minutes to prep the night before, then pop it in the oven when you get up and you have an amazing breakfast or brunch. However, when I brought it to work, I made it a day ahead, then reheated it. Does cooking alcohol remove alcohol? The short answer is NO. Cooking does not necessarily remove alcohol. Although much of the alcohol evaporates during the cooking process, it depends on how much you use, the cooking process (when you add the alcohol) and the cooking time. You can read more about that HERE. The fact that some of the alcohol remains could be of significant concern to recovering alcoholics, some parents, and others who have ethical or religious reasons for avoiding alcohol. Baileys Coffee Creamer (Irish Cream) is the perfect non-alcoholic substitute for this recipe! 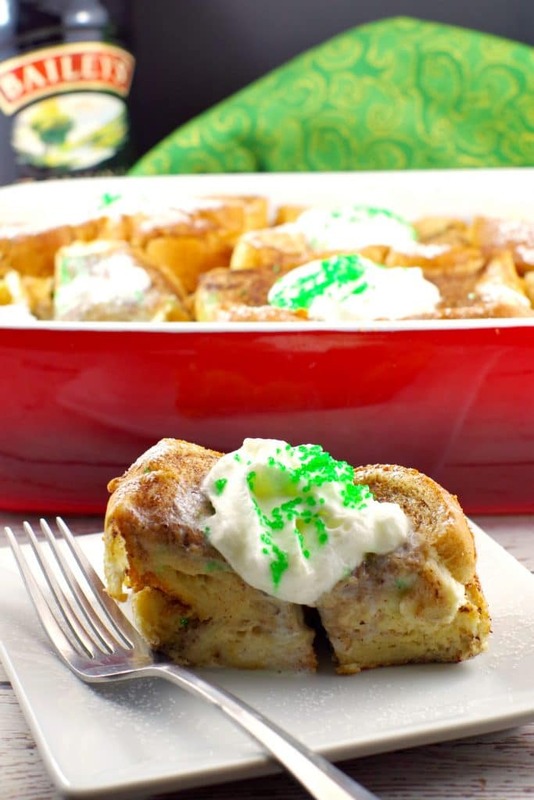 So, if you’re looking for an easy, fun and delicious St. Patrick’s Day breakfast or brunch recipe, give this a overnight french toast casserole a try! If you love Baileys Irish Cream, check out these 10 Baileys Irish Cream Desserts you need in your life! Generously spray a casserole dish with non- stick cooking spray. Arrange slices of bread in a 9 X 13-inch flat baking dish in 2 rows, overlapping the slices in a casserole dish. In a large bowl, combine the eggs, half-and-half cream, Baileys Irish Cream, brown sugar, vanilla, cinnamon and maple syrup. Then beat with a whisk until blended thoroughly. 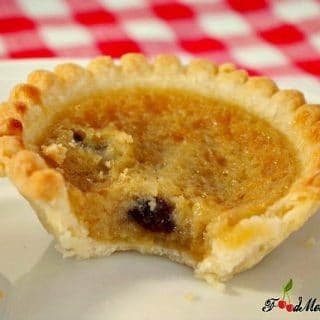 The next day, preheat oven to 350 degrees F. Remove from refrigerator, leave the foil on and bake in preheated oven for 40 minutes. Sprinkle additional cinnamon and powdered sugar on top, top with dollops of whipped cream and add green sprinkles/sparkling sugar, if desired. Serve with additional maple syrup. This recipe is part of The Country Cook’s Weekend Potluck! Great recipe. Going to make this soon. Just wondering if it would freeze well. Thanks, Tom! I hope you enjoy it 🙂 I usually try to freeze my recipes, but I didn’t get a chance with this one. I think it would get a little mushier, as there are quite a few eggs in the recipe and cooked eggs run when they are frozen. So, freezing this one may not be ideal. However, let me know if you try it! Thanks for the response, Terri. I will try freezing and let you know ow it turns out. I absolutely love this Terri! French toast bakes are one of my favourite things to make for brunch gatherings. And I’m also a huge fan of St. Patrick’s Day and all the food! Great recipe! Thanks, Marilyn! Yes, I love that it’s so simple to make! Make-ahead is the way to go for brunch gatherings! Love your substitution for “real” Bailey’s! This one will be devoured, for sure! Thanks, Elaine. Yes, it’s great for potlucks! I brought it to a work potluck (real Baileys and all :)! 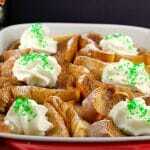 I love to do make ahead french toast bakes for gatherings. 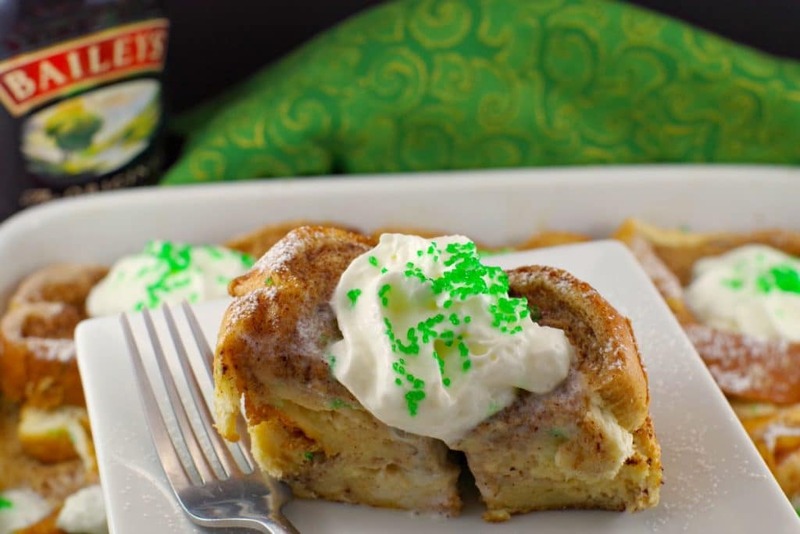 This one with Bailey’s is a perfect St Patrick’s Day breakfast that I know will be a huge hit! Thanks, Colleen! I hope you enjoy it! 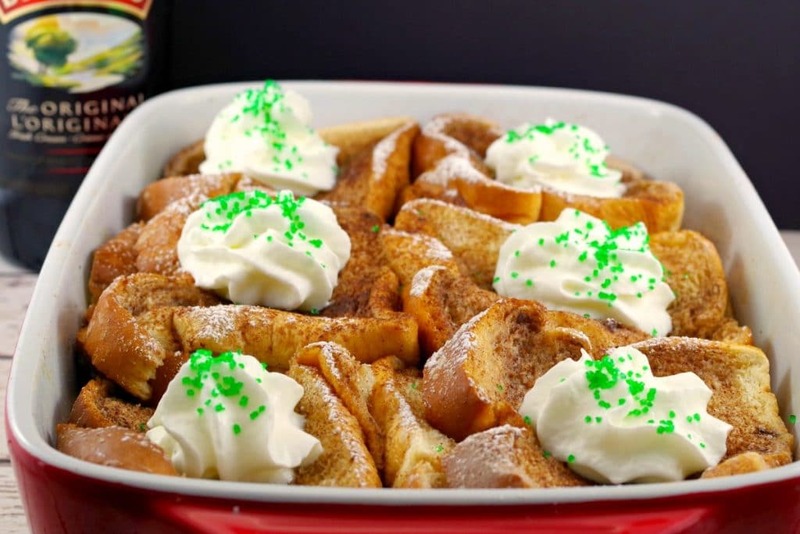 I can think of a few Bailey loving family members who would love this Overnight French Toast brunch dish, Terri! I always love having make-ahead breakfast options in my back pocket. This one is getting pinned to try very soon. Many thanks for the St. Patrick’s inspiration. Thanks, Denise! I hope you like it! Hi! Should I leave the foil on to bake? Was also thinking about tearing the bread up instead of just having slices….not sure if it will affect bake time though….sounds delicious! Sounds delicious !! but does the bread get soggy overnight? Hi Mary Anne, it doesn’t because you use a very thick bread!